The New York Times chronicled the route plotted by Chuck Berry's lyrics in the 'Promised Land', released in 1964 and reflecting the African American experience in a feature in their Travel section. Click below to learn more. Charles Berry Jr. shares memories of his father's life and music with NPR Music's Talia Schlanger on World Café. Click below to listen to the episode. CHUCK is available to hear in full via First Listen on NPR Music in advance of the album's release on June 9. NPR Music's Tom Moon writes: "If you have even a teensy bit of love for the sound Berry gave the world, the song that opens this posthumous release will bring a smile." Hear "Lady B. Goode", The Sequel To Classic "Johnny B. Goode"
The story of Berry's classic "Johnny B. Goode" continues with spiritual sequel "Lady B. Goode", off of the new album CHUCK. Chuck Berry's first official music video, "Big Boys" from CHUCK, premiered on NPR Music today. "When director's Matt Bizer and Curtis Wayne Millard set out to shoot the first-ever music video for Chuck Berry, they had just one goal: have fun. So they turned to choreographer Jeremy Green, who orchestrated a thrilling dance sequence that unfolds at a high school sock hop. The elaborate routine recalls the era's rock-and-roll swing steps and includes a brief Washington Hand Dance performance. But Green makes slight updates with elements of hip-hop that give the choreography more momentum and a slight edge." The final album and first new recordings in nearly four decades by founding rock and roll legend Chuck Berry will be released on June 16th via Dualtone Records (an Entertainment One Company). Listen to the first single from CHUCK now and pre-order your copy today to get an included instant download of "Big Boys." Working to prepare the release of this record in recent months and in fact over the last several years brought Chuck a great sense of joy and satisfaction. While our hearts are very heavy at this time, we know that Chuck had no greater wish than to see this album released to the world, and we know of no better way to celebrate and remember his 90 years of life than through his music. 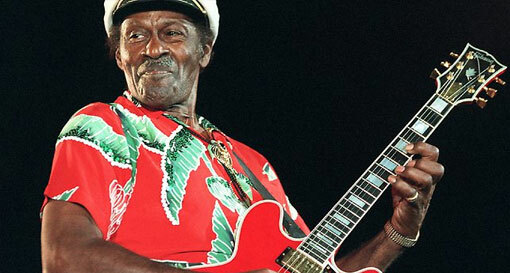 Chuck Berry to perform his 205th show at Blueberry Hill June 18th 2014. Chuck Berry to perform his 204th show at Blueberry Hill! Chuck Berry Live in Moscow Russia!